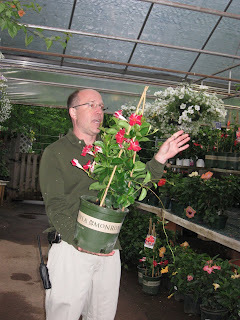 Westfield in Bloom: Dave Williams - Educator, Nursery Owner, Garden Center of America President and All Around Nice Guy! Dave Williams - Educator, Nursery Owner, Garden Center of America President and All Around Nice Guy! Dave Williams of Williams Nursery recently hosted a Westfield Area Chamber of Commerce networking event in his greenhouse and gave the attendees alot of tips on plants and gardening. The crowd really enjoyed their tour and learned alot too! (The food and drink was great too!...thanks Dave and crew! ).